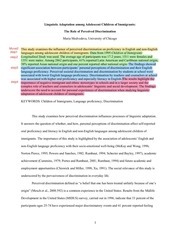 This PDF 1.3 document has been generated by easyPDF SDK 6.0 / Mac OS X 10.10 Quartz PDFContext, and has been sent on pdf-archive.com on 12/11/2014 at 10:24, from IP address 129.215.x.x. The current document download page has been viewed 2168 times. File size: 183 KB (30 pages). immigrants and their foreign-born parents. 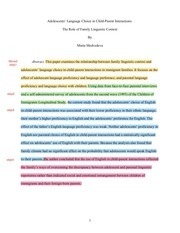 study of immigrant linguistic adaptation in the United States. adolescents will speak English to the parents? that the adolescents will speak English to the parents? that their children will speak English in child-parent interactions? will speak English in child-parent interactions? speak English to their parents. they will speak English to their parents. language choice with parents as a viable addition to other explanations. development (Grosjean 1982; Hamers and Blanc 2000). 1966; Hakuta and Pease-Alvarez 1994; Hamers and Blanc 2000). conceptualizations of ‘parenting’ and ‘children’. ethnic languages enjoyed the greatest socio-psychological benefits of selective acculturation. 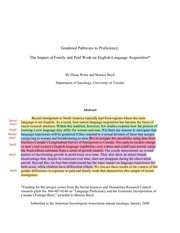 problems and future plans than did adolescents from families with a non-reciprocal language use. association between language use and child-parent relationships was established prior to midadolescence and determined family language choices afterwards. immigration from Asia and living in an area inhabited by co-ethnics. interactions was relatively immune to those outside influences. This file has been shared by a user of PDF Archive. Document ID: 00193763.